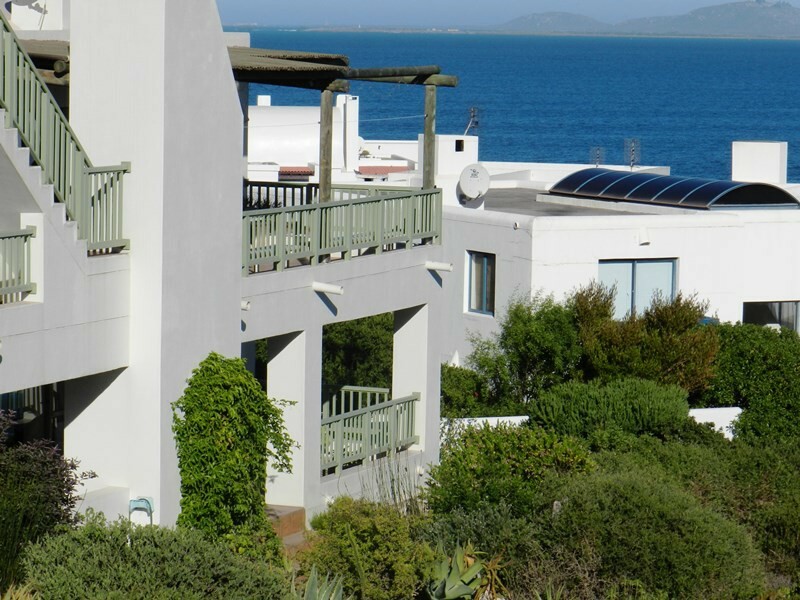 Perle of Paradise Beach, Langebaan self catering apartment is pet friendly situated in a private security estate adjacent to Club Mykonos with a safe swimming beach. If you badly in need a break from the city or from the office we have the perfect getaway for you! 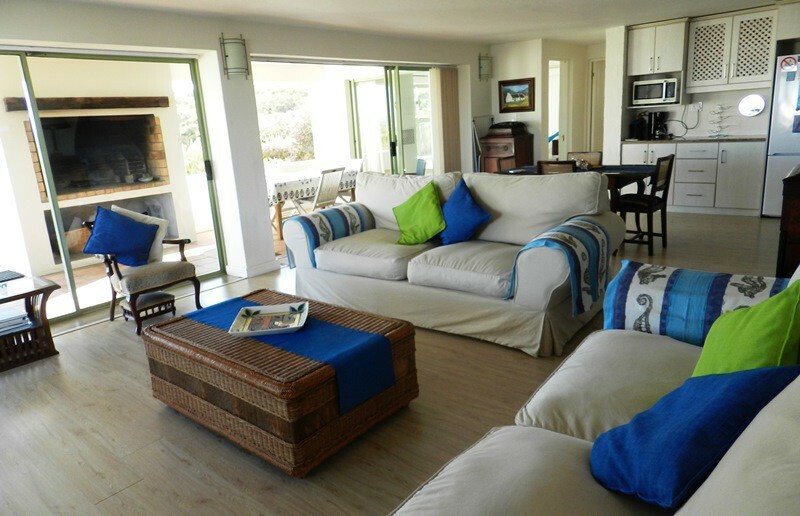 Quiet, secluded, luxurious 2 bedroom apartment at Paradise Beach, Club Mykonos, Langebaan! Wake up to the peaceful sounds of waves breaking and song of wild birds. 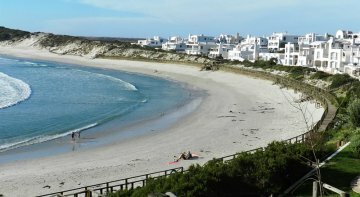 Go for a lovely hike in unspoilt dunes and beach, have a swim on our cool fresh and safe beach in walking distance from your door. Looking for adventure? - take our kayak and explore the bay, or a micro light flight, a fishing trip, learn to wind or kite surf. It’s all here for the taking. Want some entertainment? - Club Mykonos is 5 min away and offers a wide variety of entertainment, Casino, Spa, tennis, indoor and outdoor swimming pools, bars, restaurants, sailing trips, donkey rides, kids entertainment area with supervision, Put Put, shops, then a shopping centre is 2 miles away where you buy anything you need for your stay with us. 18 Hole golf course 5 miles away. Wind and kite surfing lessons in Langebaan. Explore the rest of the West Coast? we are so well situated and central to do all of that. Your welcoming hosts, Paul and Jolene Butler, are fun loving, adventure seekers, who have sailed across the Atlantic twice, travelled all around the world, explored Southern Africa, love hiking, fishing, fossil hunting. Great tour guides for the West Coast, with a wide variety of interests. 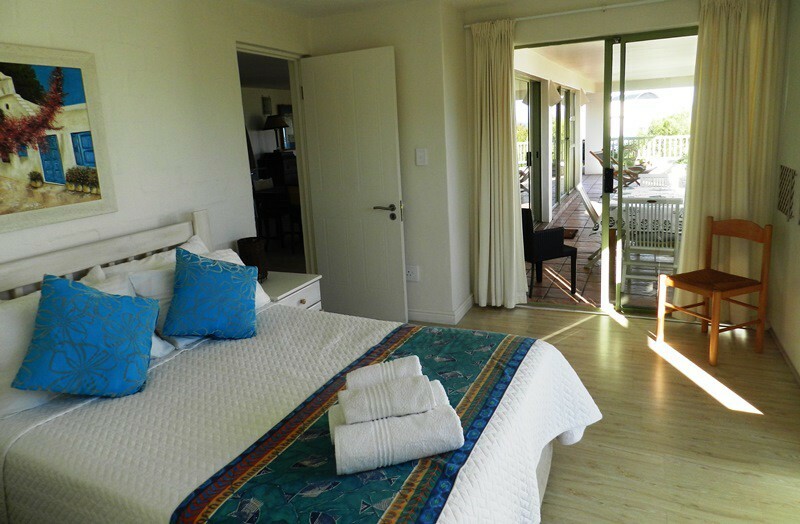 Large and extremely comfortable, two double bedroom en-suite, self catering apartment with modern décor - spacious, secure, private, with uninterrupted views of dunes and bay. The kitchen is fully equipped with a dishwasher, microwave, iron and ironing board. There is a separate dining area off the kitchen with an oak dining table that seats eight persons. First bedroom has double bed, built in cupboards, desk, a sliding door onto veranda, and a bath with shower over bath. 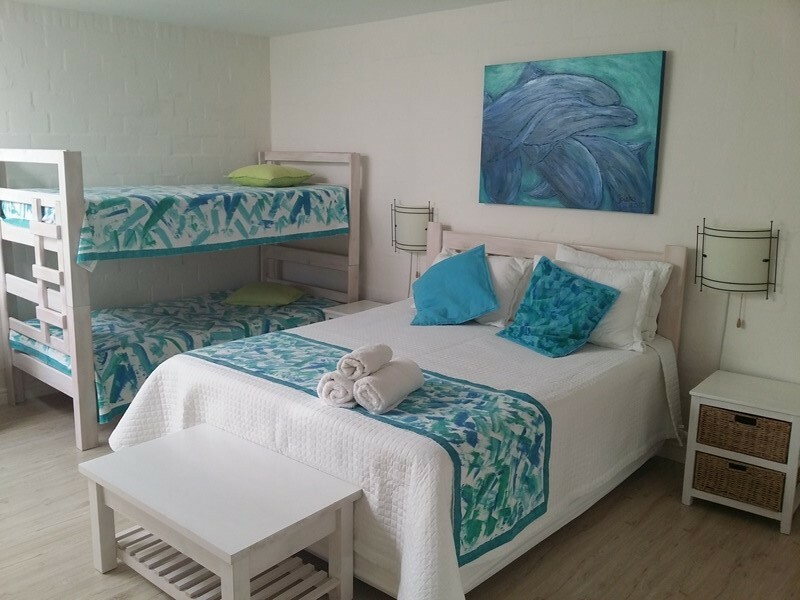 The second bedroom is has a queen size double bed, double sleeper bunk, built in cupboard, and shower. A special feature skylight lets in plenty of sun light into the room. There is an extra outdoor hot water shower with private door leading onto it for the romantic or adventurous. A large built in braai is provided on the wide undercover veranda and the comfortable lounge has a cosy wood burning indoor fireplace. A TV/DVD player and full DSTV package is available. We supply all bedding, towels, beach towels are available if necessary. Sheets and towels are replaced and the flat is cleaned once a week. There is secure off road private parking for two cars. Unspoilt beach and dune hikes from your door. During Spring it is a wild flower reserve. 15 min walk from the apartment is Club Mykonos which is a Greek sty-led village built on the waters edge and there are enough facilities to keep you busy for a while. They have a casino, five restaurants, five bars, boat cruises, yachting and water sports. Laguna Pick and Pay mall is 2 km away for all the freshest supplies you might need during your stay. West Coast National Park is a haven for lovers of ecology and nature and is a Ramsar site with a myriad of flora and fauna. The park is home to over 350 bird species and spans a great distance between Langebaan and Yzerfontein along the lagoon. Day visitors are welcome to drive, hike and cycle along the roads and paths to enjoy viewing birds in their natural habitat and watch the spring flower spectacle. West Coast Fossil Park is an area where miners discovered preserved fossils that are millions of years old. Together with Iziko Museum in Cape Town, a 14ha fossil-rich area within the mine property was declared a national Monument and the fossil park now brings the fascinating science of palaeontology to the public. 2 weeks before stay date: 50% of deposit is refundable.